I’ve been intending to write about buddhify 2 for a number of weeks. Today I came across this meditation on meditation by Russell Simmons and realized that today’s the day. I’ve been meditating consistently for a while now. Crucial for both my profession and my personality. I’ve written about it before, even. 1) Meditation improves focus. By relieving you of distraction. Crucial in this age of digital distraction and multi-tasking. 2) Meditation gets you past “success” and “failure.” Our profession is full of success (highs) and failure (lows). Meditation helps you maintain an even keel throughout all. 3) Meditation helps you be more creative. Simmons points to meditation as a vehicle for creativity, much as it is for focus. I tend to agree, since in the stillness of mind, there exists an atmosphere that can welcome creative thoughts. A busy mind may not notice them. 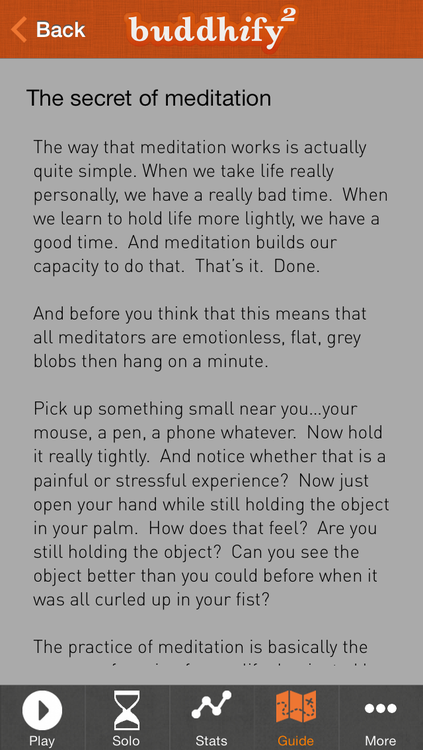 I have a meditation method of sorts but when I came across the buddhify 2 app I thought I would give it a whirl. My conclusion: it’s a great way for a non-meditator to get into the meditation groove, and it can also give a boost to an established meditation practice. The app offers a series of guided meditations organized around 15 categories, with each category offering two to three meditations. I’ve relied on the app’s guided meditations in some specific circumstances and found it incredibly helpful. The big one: I have no trouble falling asleep but often wake up in the middle of the night, mind racing. I keep my iPhone (with earbuds) on my bedside table, set to the “Can’t Sleep” series of meditations (Settle, Gentle, and Whack. Guess which one is my stand-by? Whack.). The calm, British voice of the guided meditation consistently does the trick. Sleep finds me. I also like the “Feeling Stressed” series (Flip, Replace, Rain). Because I’m a lawyer. And I often feel stress. Each meditation lasts in the five to 10 minute range. A very small time commitment for a big return on focus. And perhaps a renewed, healthier view on success and failure. And more focus and thus fuel for creativity. My conclusion: you’ve got nothing but a few minutes to lose, and much to gain. buddhify 2 — 1.99 in the App Store.